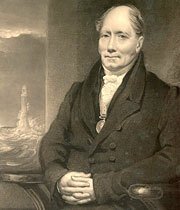 As mentioned earlier, the success of the work on Bell Rock Lighthouse enabled Stevenson to establish his own civil engineering practice by 1821. The multi-disciplinary firm would go on to operate continuously until 1952, employing Stevenson's own descendants and those of his trusted staff. The largest part of the work undertaken was marine and maritime engineering, which of course included the more than 20 lighthouses described earlier. However, the numerous proposals made by Stevenson — many of which were implemented — included many maritime works, such as harbour improvements in Scotland and northern England, and some navigation schemes. He also reported on ferry crossings and fisheries. Among the harbours for which he proposed improvements are those at Aberdeen, Ardrossan, Ayr, Ballyshannon, Chester, Cockenzie, Crail, Dundee, Fisherrow, Fraserburgh, Grangemouth, Granton, Kirkwall, Leith, Lossiemouth, North Berwick, Perth, Peterhead (Peterhead South Harbour, Peterhead North Harbour), Rothesay, Stonehaven and Sunderland. The river navigation schemes he looked at include those on the Rivers Dee, Erne, Forth, Lune, Mersey, Ribble, Severn, Tay, Tees and Wear. Among the ferry crossings he reported on are ones on the Firths of Dornoch, Forth, Pentland and Tay, and on the River Severn. Quite an impressive list. While working at Aberdeen in 1812, Stevenson found that salt water from the ocean flowed up river in a layer distinct from the fresh water flowing towards the sea. The salt water is denser (heavier) and tends to sink, so the lighter fresh water overflows it. This discovery led to his invention of the hydrophore, a water sampler for procuring samples at different depths. It also led to further experiments in Scottish rivers and firths. In May 1817, he published his results in a Royal Society of Edinburgh paper entitled On vertical differences of salinity in water. Stevenson was intrigued for most of his working life by coastal erosion and its causes, believing that it resulted from the raising of the sea bed, which then triggered a rise in sea level. He made extensive studies of the bed of the North Sea and he delivered his findings to the Wernerian Society (existed 1808-58, affiliated to the Royal Society of Edinburgh) in a series of papers. The papers are entitled Observations upon the alveus or general bed of the German Ocean and British Channel, which was read in March 1816, followed by On the bed of the German Ocean, or North Sea read in March 1820, and Remarks upon the wasting effects of the sea on the shore of Cheshire, between the rivers Mersey and Dee, which was read in March 1828. In 1821, Stevenson proved his definitive understanding of maritime engineering with the design and construction of a sea wall at Trinity, between Granton and Leith, now part of Edinburgh. About 275m of this wall, west of Trinity Road, is still in service. It has a cycloidally curved vertical profile in order for the upper part to "bring gravity into action against the rise of the waves". For economy the wall was made mainly in roughly dressed beach boulders but, as can be seen today, its curve proved difficult to execute accurately. Nevertheless, it's stood the test of time. However, at his later harbour works, such as Fisherrow and Stonehaven, Stevenson did not repeat cycloidal design, using a steep uniform batter instead. These too remain in service. In 1933-34, Stevenson and his son Alan worked together on the improvements to the navigation channel in the River Tay between Perth and Dundee. They deepened the main channel so that ships could reach Perth without waiting for high tide. Meanwhile, he continued with practical experiments on the progressive damage to timber by Limnoria terebrans. This small creature, commonly known as gribble, is a marine isopod crustacean that bores into, and ultimately destroys, submerged timbers. It had been discovered by Stevenson in 1808. He had set up comparative trials on Bell Rock, using different types of wood, and he monitored the results in 1814, 1821, 1837 and 1843. His work influenced the universal adoption of greenheart (Ocotea rodiaei) — a resistant South American tropical hardwood — for marine and maritime timbers. Stevenson's three engineer sons joined him in partnership in the practice — Alan in about 1832, David in 1838 and Thomas in 1846 on his father's retirement. His other surviving son, Robert Jnr, became a doctor of medicine and at the time of his father's death in 1850 was Surgeon of Her Majesty's Third Regiment of Foot. Alan, David and Thomas built a further 43 lighthouses between them, and more were constructed when Robert's grandsons joined the family firm. Perhaps the most notable of all these is Alan Stevenson's Skerryvore Lighthouse (1838-44), which is the tallest lighthouse in Scotland. 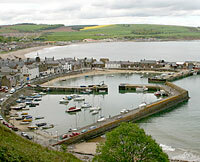 The sea wall, enclosing pier and breasting of the southern area at Stonehaven Harbour were designed by Robert Stevenson and constructed 1825-26. The internal jetty dates from 1837. Stretching out to the right (out of shot), a mass concrete breakwater (1901) protects the harbour, which is south of Aberdeen on the Scottish east coast. It was once a herring port but is now used for recreational boating. 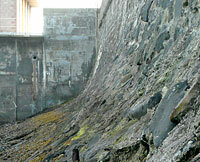 The sea wall at Trinity in Edinburgh was constructed in 1821 and about 275m of it is still in use. Its cycloidally curved profile is considered proof of Stevenson's definitive understanding of maritime engineering.